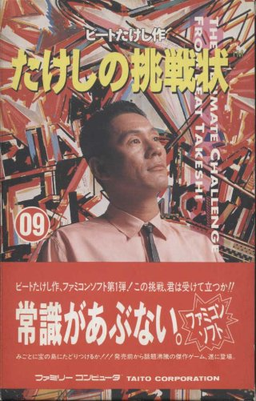 Thanks to Tweeter Paul Weedon, I was last week alerted to the existence of Takeshi no Chōsenjō aka Takeshi’s Challenge, the ill-fated 1988 venture into the world of videogaming by indefatigable (and consistently surprising) Japanese media polymath Takeshi Kitano. “So what?”, I can sort of hear you mutter. Well, by all accounts, it turns out that the game (released only in Japan on the NES) was inspired more by Takeshi’s hatred of video games than anything else, and was almost impossible to complete. Completion of the game requires several unorthodox uses of the Famicom system, such as using the second controller microphone to speak while playing pachinko, or not touching the controls for an hour. The player must also maneuver a hang-glider to complete a side-scrolling shooting game, made extremely difficult because the controls do not allow the player to move upwards on the screen. Minor details such as not quitting the salaryman job, not getting a divorce, or not beating up the old man who provides the treasure map, can prevent the player from reaching the ending. Apparently the game frequently crops up on ‘Worst Ever’ lists, but I for one would certainly love to give it a shot. UK non-cinephile viewers might know Kitano best from the lunatic gameshow Takeshi’s Castle, an infinitely more dangerous version of It’s A Knockout, which was voiceovered in characteristically cheeky style by Scouse comedian Craig Charles. However, Kitano is one of Japan’s most distinctive cinematic voices, not to mention one of the most important figures in my film education as a younger person. I remember when Film 4 did a short season of his best work (including Violent Cop, Hana-Bi and Sonatine) and I was astonished by the jarringly expressionistic manner in which he used editing in the presentation of violence, and the haunting combination of deadpan comedy and serious emotion that seemed to seep through every scene. This entry was posted in Bits and pieces and tagged Funny, japanese, NES, random, salaryman, Takeshi Kitano, Takeshi's Challenge, video, videogame on March 18, 2013 by Ashley Clark.